Using a large potentiometer for volume control is about more than just ergonomics. It also delivers a higher degree of precision and much quicker level adjustments. It’s not only convenient, it can help to deliver a better mix. When it comes to mixing, pros know it’s best to get a second (and third) opinion. 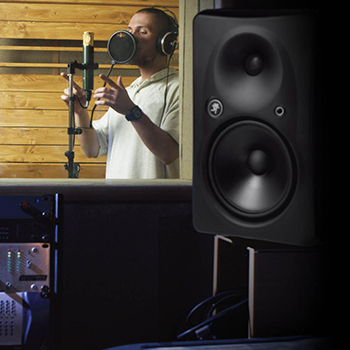 So Big Knob lets you quickly switch between three pairs of studio monitors, or two studio monitors and a subwoofer, or studio monitors and a home stereo. Creating a mix that translates well on any system means listening on different monitors. With Big Knob, this process is efficient and gets out of the way so you can focus on the sound. With a wealth of different source connections available, Big Knob is great for comparing your mix against a multitude of alternate sources. Connect up to four different stereo inputs sources and ensure your mix stacks up to your favorite recording or other source. Good communication between the control room and tracking room can make all the difference during a session. With Big Knob, you can keep your hands on the mix instead of wildly gesturing to the talent. With a built-in talkback mic and two separate headphone outs, Big Knob makes communication simple. All The Right Connections Although its shiny silver knob is a head-turning feature, Big Knob's rear panel is equally impressive. There you’ll find three distinct Monitor outputs with individual level control; 2-Track A and 2-Track B stereo outputs with level selection switches; a DAW stereo output for your computer; a Studio output with level control; a Phones Mix input with level selection switch; 2-Track A and 2-Track B Stereo Source inputs with level control; a DAW Mix input from your computer with level control; and even a Phono input with level control for direct connection to your turntable. The level of monitoring flexibility that Big Knob delivers is perfect for professional recordings studios of all shapes and sizes. The volume control enough is great for home or project studios. Big Knob provides all the connections needed to cover your studio’s expansion over time. It’s also great for applications like video post-production and broadcast. You can connect a lot of things to a Big Knob. Why not some of this stuff?